Between The Lines: Talk to me! Dear friends from all over the world, we celebrate on Friday, in the European Union, European Day of Languages. On this occasion, we thought that we can transform the blog into a FORUM, a space for dialogue (not only European but also international), which can establish a bridge between cultures and peoples which, in the traditional way, are in affirmation of permanent competition. You are invited, therefore, to post to the topic below your comments and your views on multiculturalism and multilingualism. LANGUAGES A RE THE LAB OF DREAMS. Words of wisdom written by Lydia, Maria and Anastasia, 16 during their English class. Many thanks to Ms Dretaki for her help. In the photo you can see old and new members of our book club who commented on today's post, holding the Library's dictionaries. Ms Radulescu's invitation set our library on fire today!! ...we don't know which is the angel's language, but today we felt the angels very close to us, because we heard them in so many ways. Thanks again to Helen and Greek team from Elefsina, for the gift they offered us today. A great day. I know that the Eskimoes have 49 words for the snow. I told that to Aris, who is presently preparing his comment in the library, and we started talking about cultural richnese and multiligualism. Wait and see what he thinks. you are right, Aris. In Romania happens the same worrying fact: most of the romanian teenagers speak in "romglish", in which they mix romanian with english...It's great that different countries can speak the same language, but we don't have to forget our own. Elders should use a richer vocabulary to give an example to us. As a group we think there should be an Esperanto at schools because language learning is expensive. The wide variety of languages makes the world an interesting and mysterious place, because every time you travel abroad, you discover greater and greater things. No languages, no life. Languages are the lab of dreams. Am incercat, pornind de la povestea turnului Babel, sa caut o explicatie a ceea ce sunt limbile astazi. In primul rand, daca e sa dam credit povestii,scopul amestecului a fost ca oamenii sa nu mai poata stabili relatii eficiente intre ei, astfel incat divinitatea sa nu mai fie amenintata. In acest sens, daca urmarim tensiunile care se nasc tocmai din aceasta diferenta, probabil ca divinitatea si+a atins scopul. Pe de alta parte, povestea poate fi interpretata si altfel. As zica, mai degraba, ca amestecul limbilor a fost mai degraba un test dat de Dumnezeu oamenilor, pentru a dovedi maturitatea lor. I tried, from the Tower of Babel story, to find an explanation of what languages are today. First, if you give credit story, the purpose of the mixture has been that people can not establish relations between them, so that divinity was no longer threatened. In this sense, when tensions are born that way from this difference, and likely divinity + achieved goal. On the other hand, the story can be interpreted and otherwise. I say, rather, the confusion was rather a test given by God to men to prove their maturity. Denisa. Intrebarea care se ridica aici este: Cat de maturi sunt oamenii? Au ajuns ei la acel nivel de intelegere care sa le permita acceptarea neconditionata a "celuilalt", in baza a ceea ce avem cu totii in comun? Cine poate sa raspunda? cred ca exista la nivelul mentalului social o ezitare privind acceptarea neconditionata a celuilalt, a strainului. fiindca in felul acesta simte ca apartenenta sa sociala, traditiile, cultura, valoriile definitorii pentru acel spatiu se vor "pierde" prin actiunea uniformizatoare a globalismului. About Esperanto.. I believe that the attempt to form just one language for everybody is a bit selfish for us, Europeans..because we have mostly latin languages..we are somehow used with the languages composing Esperanto..but for example..the Eastern Cultures (Chinese, Japanise) will have a hard time learning it..and even if they learn it, after a while they will form new words, or they will create a new dialect.. So let's embrace multilingualism.. and start learning as many languages as we can! oh..and no matter how you pronounce or name a cat - chat, pisica, katzen - it still remains a sweet little kitten, that can brighten your day!! Educarea adultilor, in ceea ce priveste invatarea limbilor straine, ar trebui sa fie prioritara mai ales dupa aderarea Romaniei la UE.Cursurile de limba greaca de la Comunitatea Elena mi-au fost foarte folositoare in activitatea desfasurata ca ghid de turism. Παρ' όλο που διδασκόμαστε γλώσσες στο σχολείο δωρεάν, παρατηρείται ένας βαθμός αδιαφορίας από τους μαθητές. Κι αυτό εξαιτίας της πεποίθησης των νέων ότι το μάθημα επί πληρωμή είναι πιο αποδοτικό από τη δωρεάν παιδεία. Αυτό, και όσοι και όσα διαπλέκονται, είναι η θλιβερή πλευρά. Πρέπει να γεφυρωθεί η σχέση μαθητή-σχολείου. I have been teaching ENGLISH for a long time and I noticed that pupils and children, generally speaking are the same everywhere.English is something fun for some of them, something they think they can handle very easily or something unaccesible, distant ,uncomprehensible for others.I love this language,I enjoy speaking it and it is the language that best expresses my own thoughts and feelings.If angels are to use an universal language in heaven this should be English. Dear colleague, you may not agree, therefor, with our author, Nikos Kazanztakis, who says that SILENCE is the language of angels. I do not think it matters what language talk as long as we have said the same thing. I think the barriers between people are rather different way of thinking or dealing with a problem, not that they do not speak the same language. When we have something to say or when they are compatible with a person can easily find the appropriate method for expression. Worse is when we have nothing to say or when not find people with whom to talk. I think that languages reflect our cultural and identity differences, but, in the mean time, they allow us to understand ourselves. To Communicate. A very good friend of mine told me a few months after his departure in Finland how difficult was for him to learn the language.More exactly he told me that he felt for the first time in his life the same feeling that the people with hearing disabilities have . Although Finns are not as skeptical in learning foreign languages, especially English, as other peoples, in marginal areas of big cities Finnish is the first language.And when you can not communicate with the person next to you is like you were dumb or deaf. As Aris was telling, the learning of foreign languages should not necessarily mean the loss of specificity, the originality of each nation and each language.Many international organizations promote the idea of union, the creation of a single language system that allows an easier communication, but at the same time they promote the intact preservation of traditions, habits and characteristics of the national languages which unite by diversity. And as is the case of our project, without the use of English communication would be impossible, but at the same time without the information that we shared on the Romanian and Greek culture, language,traditions, we wouldn't learn anything and the charm would be lost. Diana, you said it all with the deaf and dumb metaphor about not nowing the language of the country you chose to live in. It is a terrible feeling. Only one who has experienced it can understand. Yesterday, one of the best day's in the library's calendar, thanks to etwinning, we discussed a lot about language learning, espranto, youth codes and the digital era. Although it is a topic for essays in the greek Lyceum, discussing it with feedback from Romania, made it quite unique. Your answers will be given for English class, Mrs Dretaki helped a lot yesterday and we'll let you know. Τα παιδιά το καταευχαριστήθηκαν , το ίδιο και εμείς οι καθηγητές τους. Η γλώσσα που χρησιμοποιήθηκε ήταν κατά κόρον η Αγγλική! Αν θέλετε κάποιες άλλες πληροφορίες στη διάθεσή σας! 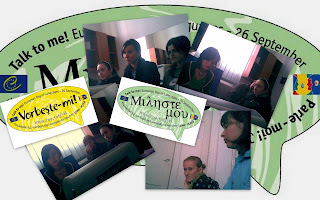 Ms Tsarouha, teacher responsible of the library in 1o genico Lykeio Halkidas, a city near Athens, coordinated an etwinning chat in English between her school and Romania, Italy, Poland and Spain, with the help of her colleagues. Many topics were discussed and everybody had fun doing it. It is good to see such efforts that unites so many schools in Europe through distant learning. Είμαστε στην ευχάριστη θέση να γνωρίζουμε ότι αυτή η αργία είχε τόσο μεγάλο ακροατήριο. Συγχαρώ την κ. Ελένη Tsaroucha και συναδέλφους και να ευχηθώ κάθε επιτυχία αυτών των σχεδίων εταιρικής σχέσης. Η γλώσσα είναι το παράθυρο που μας ενώνει με τον Κόσμο. Όσο περισσότερα παράθυρα έχουμε τόσο πιο πλούσιοι γινόμαστε. Σε γνώσεις, συναισθήματα και απολαύσεις. Είναι καταπληκτική η συνεργασία αυτή των δύο σας σχολείων. Και πολύ πρωτότυπο το θέμα. Συγχαρητήρια. Language is the window that unites us with the World. The more windows we have, the richer we become. In knowledge, feelings, enjoyments and delights. This cooperation between the two schools is magnificent! Congratulations!